Cellulosic Electrodes - Knowledge and Support – Zika Industries Ltd.
Home Articles Cellulosic Electrodes - Knowledge and Support – Zika Industries Ltd. Despite increasing use of automatic welding, there is still relatively high segment of manual welding with coated electrodes. 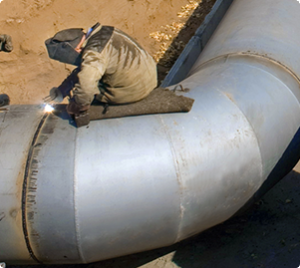 For welding and repairing of pipelines, mainly cellulosic and basic coated electrodes are used. Cellulosic electrodes are characterized by deep penetration, formation of good root reinforcement, low sensitivity to contamination of welded edges, absence of start porosity, relatively high welding velocities. However high content of cellulose and moisture in coating causes high hydrogen content. Chemical composition of cellulosic coating causes relatively high content of non-metallic inclusion in the weld metal and therefore low impact energy values. Electrodes with basic coating are perfect from the point of metallurgy. They provide low content of diffusible hydrogen in weld metal, high plasticity and high strength of the weld and good ability of micro alloying. However, welding electrodes with basic coating have lower penetration and poorer weldability then cellulosic. Basic electrodes are more professional and used mainly for critical constructions. First types of cellulosic electrodes were developed in USA in early 1930’s, there was wide usage during decade of these electrodes instead of thin coated (“chock electrodes”). In the same period, cellulosic electrodes had been started to use for welding of pipelines. After development of electrodes with other types of coating, mainly basic and rutile types the usage of cellulosic electrodes was decreased. Currently, the main application of cellulosic electrodes is welding of water pipelines. Although, each well-known producer of coated electrodes has cellulosic-coated electrodes within advised products. The coating of cellulosic electrodes consists of cellulose powder, slag formers components – rutile or titanium dioxide, enriched iron ores and/or iron powder, carbonates (marble, magnesite or dolomite), aluminum silicates (talk, coaline, etc. ), deoxidizers (ferromanganese)’ and binders (silicate liquid glasses). Coating of cellulosic electrodes for welding of high strength steels contains ferromolybdenum and Nickel powder. Cellulosic electrodes characterized by thin coating and low mass coefficient (15-25%). Coating of cellulosic electrodes contains 20-45 wt-% of cellulose powder. While burning in welding arc this powder produce shielding gases, which protect melted metal from reaction with air. In comparison with regular electrodes, cellulose coated electrodes must contain some quantity of moisture. This requirement is caused by necessity of coating oxidizing potential and decreasing of redox process of carbon, silicon and manganese. Therefore drying of cellulosic electrodes after production process must be avoided. Exposure to bright sunlight in warm, dry areas may be just as damaging as low-temperature baking, so it is best to keep cellulosic-coated electrodes in cool, shaded regions throughout the work day. Rehydrating the electrodes does not restore them to the as-received condition, so the best practice is to discard electrodes that have been exposed to particularly hot or dry conditions, and under no circumstances should cellulosic electrodes ever be placed in electrode drying ovens. For more info about Zika’s Cellulosic electrodes click here.